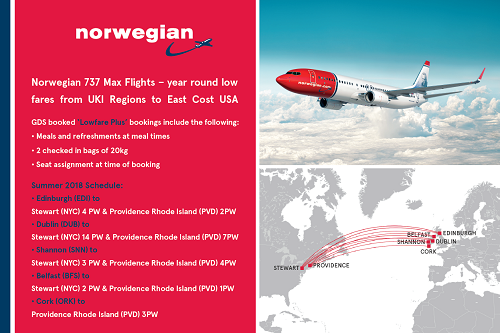 Norwegian has launched 10 new routes with 38 new weekly transatlantic flights this summer from Edinburgh, Belfast, Cork, Shannon and Dublin. The flights serve three destinations on the US east coast, with a focus on smaller US airports – these airports offer good access into the New York, Boston and New England areas but carry significantly lower landing charges, allowing Norwegian to offer some truly affordable fares that will allow as many people as possible to fly. The new transatlantic routes are operated on brand new Boeing 737 MAX aircraft - passengers are able to travel in a fresh and modern single-class economy cabin with hot and cold food options available to purchase onboard.